1. Never ever take to the water alone – bring some friends who are competent canoeists and enjoy the river together! 2. Know how to swim and have the water confidence to deal with a capsised boat and get ashore safely. 3. Before you take to the water, take time to think safety. Always consider other water users. 4. Check your canoe is seaworthy and suitable for purpose. Get a second opinion. 5. 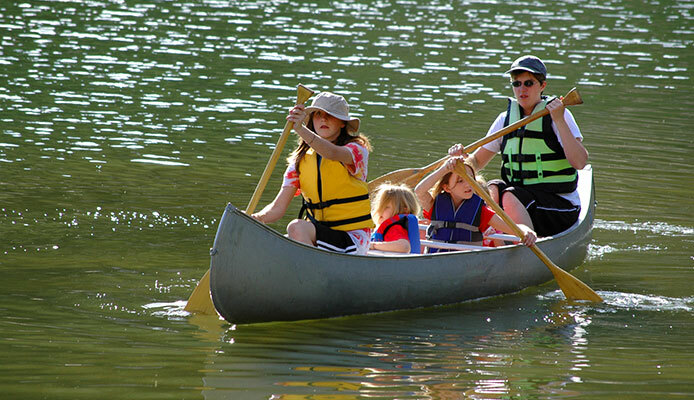 Do not canoe without adequate buoyancy in the form of a personal life jacket or buoyancy aid. Canoe buoyancy should be sufficient to keep both the canoe and its occupants afloat if you capsize. 6. Mark the inside of your canoe with your name and telephone number – and put reflective tape on the outside to aid detection. 7. Dress for survival. Wear suitable highly visible, warm protective clothing marked with reflective tape. 8. Carry first aid kit, mini-flares, a strobe light, torch, map, compass and a whistle. 9. Advise someone ashore of the details of your planned trip, including times of departure and return. 10. Keep within your own abilities and the limitations of your canoe. 11. If you get into trouble, raise the alarm sooner rather than later, and stay with your canoe. 12. Check and heed the local weather forecast. The weather can be unpredictable so always be prepared for the worst. Check local forecasts and be prepared to change your plans accordingly. Return to base in good time – and well before daylight fades. Visit http://www.met.ie/ for weather conditions. 13. The River Shannon and Lough Derg can become rough in strong winds – carrying rafting poles is a sensible precaution (rafted canoes are more stable in rough conditions). 14. Log onto http://www.waterwaysireland.org/ for information on navigation in Limerick City. 15. Avoid strong currents and local hazards.